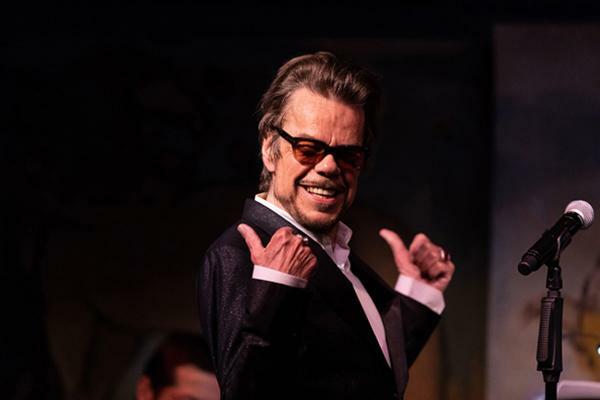 Buster Poindexter and his band are FUN! A vocalist/songwriter (later, actor) who burst on the East Village scene in the early 1970s (with birth name David Johansen) as lead of the punk rock New York Dolls, the musician retains every bit of the intrinsic cool with which we associate him. His pompadour may be a bit less emphasized, but it’s there, springy as ever. The slight frame, ironic head turns, rhythmic knee, limp wrist, and chicken-shoulders still package a deep, gravel voice and haHA attitude. Neither having seen The Dolls nor been a punk fan, I’m admittedly a second chapter gal, i.e. he wasn’t on my radar till Poindexter. The current show, all his own songs, is revelatory. Regaling us about early days with droll humor, Poindexter offers everything from young pop and spare, lounge punk to ontological blues and calypso. This being the Carlyle, there are only a couple of raise the roof numbers-which is fine. As in the playful first song, Poindexter manages to be both veteran rocker and classy at the same time. “Funky But Chic” My momma thinks I look pretty fruity but in jeans I feel rockin’/I don’t wear nothin’ not too fussy or neat … let’s get on down to the bOtique/…bring back somethin’ funky, but chic…he sings. Fingers play the air, one hand wraps around the microphone head. Next comes “Melody,” a gentle, swaying calypso. Here’s the thing with Poindexter- that gruff voice in contrast to a really pretty tune and/or in-your-head lyrics, is rare and affecting. …My baby/Got mystical frenzy/Tempered by an irony/Verging on blasphemy…My baby brings me happiness/Deceiving nothingness… “Better Than You.” Only a outlaw poet uses phrases like these in a rock song to which you’re bopping along without expectation. Temptation to exist/Obsession to persist/Death-defying romance/Give me another kiss… “Temptation to Exist.” The New York Dolls were popular but never hit financial heights. Johansen went solo. 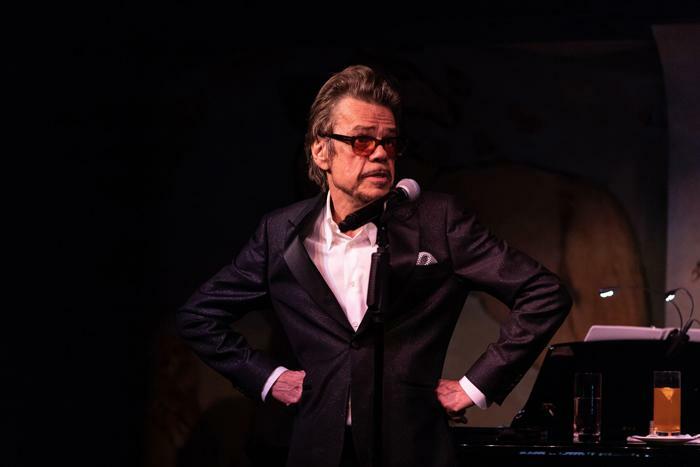 “I worked with guys who thought peas grew in a can and that Viva Magazine was a book.” Eventually, except for a parentheses featuring “those Dolls still taking in air,” he became Buster Poindexter. 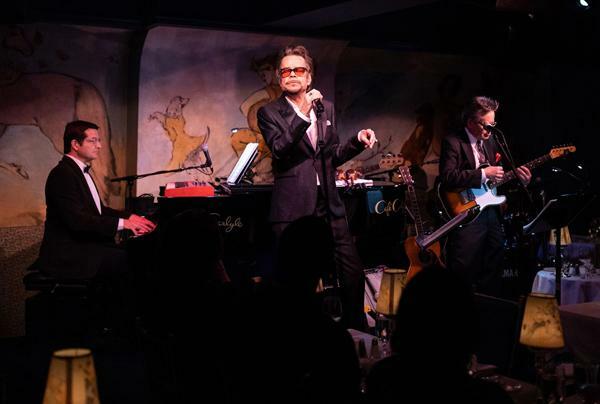 Reunion years delivered songs for then young “clientele” like “Plenty of Music” and “Talk To Me Baby” as well as “more mature” numbers such as “Making It Rain,” written housebound at Todd Rundgrun’s in Hawaii. In the latter, Brian Koonin’s guitar and John Deley’s piano are pristine, evocative/ painterly. Pelting grows harder, music swells. It’s impossible not to chair dance. “Dancing On the Lip of a Volcano” is exemplary of Poindexter’s dichotomy: In the center of action of my psyche’s need for love/I want liberation and joy/In a paroxysm of intoxication, inspiration/Ain’t no way to be coy…a verse, leads to the chorus, So let the fire lick/ (We’re dancing)/We are creating it/(We’re dancing)…It’s a kind of catch-and-release approach. We never lose infectious rhythm, but oh how lyrics absorb. “Totalitarian State” might be a song for the Trump era. It’s a New Orleans stomp with wowza boogie piano, loose-limbed drums, hot bass, fleet-fingered guitar. (Lyrics alas unavailable) Notes expand and contract like rubber bands. Poindexter extends both arms. We’re all in this together. Poindexter slouches, part on piano, part on a stool, the curved silhouette of Ichabod Crane. This is a performer whose laugh sounds like lyric. His tinted rose glasses barely reflect. A drink in one hand, the mic in his other, the philosopher pensively renders “Wandering Spirit” written with Koonin…That old eternal spirit/Whispers in my ear/Radiance of the infinite/Seems to be everywhere/ But my weary eyes can’t see it/My old ears cannot hear…It’s a gentle, somber, jaded request. “Take a Good Looks at My Good Looks Baby”…cause I’ll be gone…is an entire break-up scenario. Music is rough and ready, but lyrics- Some rainy day, I’ll find ya crying/With love and animus… Our noisy years will seem like moments/In a film of/Eternal tears…are –elevated. We close with real rock n’ roll- music too emphatic to make out lyrics. 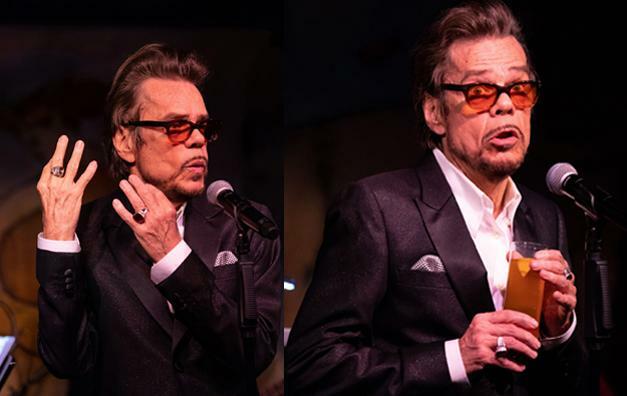 Iconoclast Buster Poindexter has the talent to remain entertaining; the articulate perception to intrigue. He’s a musical pied piper and a lyrical thinker. The band is terrific. This is FUN.